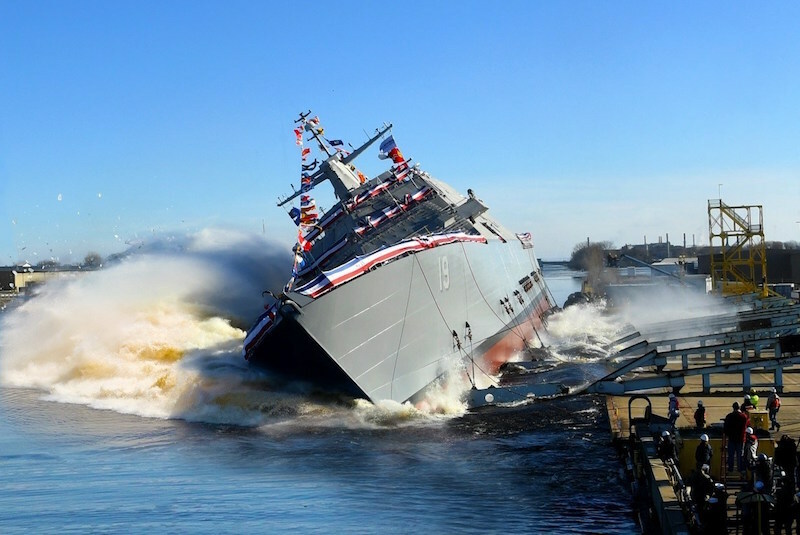 MARINETTE, Wis. --- The Lockheed Martin-led shipbuilding team launched Littoral Combat Ship (LCS) 19, the future USS St. Louis into the Menominee River at the Fincantieri Marinette Marine Shipyard. Ship sponsor Barbara Broadhurst Taylor, the daughter of a decorated World War II aviator, christened LCS 19 just prior to launch. The 19th Littoral Combat Ship, the future USS St. Louis, launches sideways into the Menominee River in Marinette, Wisconsin, on Dec. 15. "LCS 19 is the second ship we've christened and launched this year. Our shipbuilding team has truly hit its stride. We completed trials on three ships and delivered two more. Once delivered to the Navy, LCS 19 will be on its way to independently completing targeted missions around the world," said Joe DePietro, Lockheed Martin vice president and general manager of Small Combatants and Ship Systems. "We remain focused on delivering these affordable ships to the fleet as quickly as possible and increasing capability with each hull." "I am thrilled and very honored to be the sponsor of the future USS St. Louis. The combination of my family's military background and the enduring spirit of the great city of St. Louis make this incredibly meaningful," Taylor said. "This is the seventh ship to bear the name St. Louis, and I know that the people of our great city are extremely proud that this distinguished legacy will continue." -- It is fast—capable of speeds in excess of 40 knots. -- It is automated—with the most efficient staffing of any combat ship. -- It is lethal—standard equipped with Rolling Airframe Missiles (RAM) and a Mark 110 gun, capable of firing 220 rounds per minute. -- It is flexible—with 40 percent of the hull easily reconfigurable, integrating capabilities like the Longbow Hellfire Missiles, 30mm guns, and manned and unmanned vehicles targeted to meet today's and tomorrow's missions. "We are proud to be building LCS 19 and her sister ships at the heartland's only naval shipyard," said Jan Allman, Fincantieri Marinette Marine president and CEO. "Today's launch and christening is a testament to the hard work of more than 2,000 workers who pass through the shipyard's gates, put on their hard hats and build American warships." Fincantieri is the leading western shipbuilder with a rich history dating back more than 230 years, and a track record of building more than 7,000 ships. Fincantieri Marine Group is the American subsidiary of Fincantieri, and operates three Great Lakes Shipyards: Fincantieri Marinette Marine, Fincantieri Bay Shipbuilding, and Fincantieri ACE Marine.